As part of efforts to ensure that only goods with acceptable quality are exported from Nigeria, the Central Bank of Nigeria (CBN) has appointed two additional Pre-shipment Inspection Agents (PIAs) for non-oil exports. In January 2007, the Government enlarged the scope of the exports pre-shipment inspection scheme to include crude oil and gas. Since the scheme came into operation on October 2004, the company charged with the responsibility for exports Pre-shipment inspection has opened a number of offices across the country. Under the Nigerian Export Supervision Scheme (NESS), all exports from Nigeria are subject to inspection by the Inspection Agents prior to their shipment; with the exception of certain items. The exempted items are personal effects, used motor vehicles, day old poultry, human parts for transplant purpose, human remains, vaccines, yeast, and periodicals / magazines. 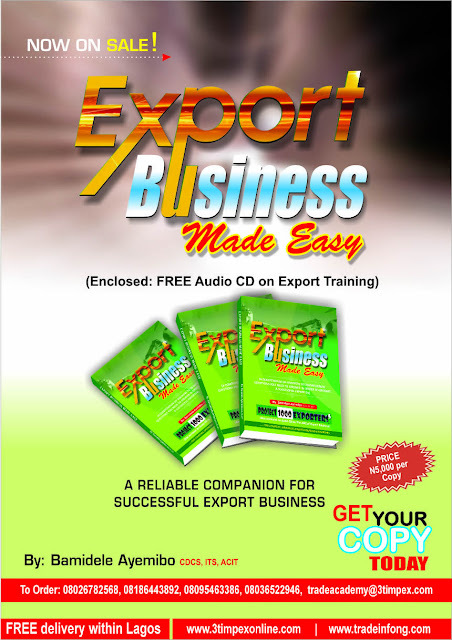 Others are non-commercial exports, such as gifts, trade samples/printed business matter, machinery and equipment for repairs abroad and return to Nigeria, machinery and equipment for replacement, return of machinery and equipment after execution of a specific contract, re-exports and trans-shipments. Just as the country waits with great anticipation for President Muhammadu Buhari to put his house in order and kickstart a new beginning in governance, I cannot but wonder what sectors Mr. President will be focusing on to drive the economy, attract investors and increase employment. In researching for my 14th October 2014 editorial titled ‘The Business of Politics in Adamawa State’, I discovered how richly endowed the state was and noted thus in the said editorial ‘In the last few years Adamawa State has been in the news for so many unpleasant reasons including being at the forefront of confronting the Boko Haram menace. Actually you could describe Adamawa State as being a veritable war zone within Nigeria. The state however is also richly endowed with abundant solid minerals such as marble, kaolin, onyx, emeralds, limestone and zinc. It is also sited on fertile land: a true investor’s haven.’ ‘An investor’s haven’ can be aptly used to describe a good number of states right across the country, all waiting to be tapped for their potential. One of the sectors I believe Mr. President should be focusing on with clear-eyed determination is the mining sector. Nigeria is said to have as many as 44 different types of minerals in more than 500 locations across the country. The Ministry of Mines and Steel Development has further classified these minerals into three groups ‘Industrial Minerals’, ‘World Class Minerals’ and World Class Minerals with Strategic Importance for Nigeria.’ This last group includes coal, bitumen, limestone, iron ore, barites, gold and lead-zinc. Coal is abundant in the Middle Belt and South Eastern regions of the country most notably in Anambra, Kogi, Benue and Enugu States. It is estimated to exist in reserves of about 396 million metric tonnes, but unproven reserves may be far greater at 1,134 million tonnes. The estimated probable reserves of bitumen in Ondo State are 16 billion barrels, while those of tarsands and heavy oil are estimated at 42 billion barrels. The probable reserve of bitumen and heavy oil in the entire tarsand belt is expected to double the reserves in Ondo State. The largest and purest deposits of limestone are found in the South West and Middle Belt regions of the country. Limestone deposition in the South West region of Nigeria have been estimated at 31 million tonnes whilst sizeable iron ore deposits have been found mainly in the country’s North West, North East and South East regions.’ The different types of iron ores account for some 882 million tonnes of unexploited ore in Nigeria today. Proven reserves of Barites in just Benue and Nassarawa States have been estimated at 111,000 tonnes while the estimated probable (unproven) reserves across the country, where mining is considered viable, are estimated at over 21million metric tonnes. In Nigeria lead-zinc ores are usually found together and they are often associated with copper and silver. Lead-Zinc is found along the North East and South West trending belts. They occur in commercial quantities in the North East and Middle Belt region of Nigeria. The estimated reserves are well over 100,000 tonnes of lead and 80,000 tonnes of zinc. Gold is associated with the North West, Middle Belt and South West regions of Nigeria, although there are smaller occurrences beyond these major areas. The preliminary exploration and identification of deposits which is still ongoing has confirmed ten sites to be holding reserves of over 50,000 ounces of high quality gold. (KPMG’s Report on the Nigerian Mining Sector 2012). In the 1970s, prior to the ‘oil boom’ solid minerals accounted for a much larger percentage of our Gross Domestic Product (GDP) than today. In particular Nigeria was a major exporter of tin and coal as well as being the world’s largest exporter of columbite. Today solid minerals only account for less than 0.4% of national GDP as with the discovery of crude oil, national exploitation of these mineral resources has fallen steeply or totally ceased in favour of the mining and exploitation of our so called ‘black gold’. In light of this fact attention has gradually but rather slowly begun to turn back to the mining and extractive industries for solid minerals because of the strong potential they present for alternative sources of revenue. The regulatory framework behind the exploitation of solid minerals in Nigeria has been characterised mainly by central government control. Attempts at legislating on minerals and mining can be traced as far back as 1946 with the Mineral Ordinance which vested the ownership of all minerals in the Crown. This was adopted in the regulatory regime of the 1970s which led to a mass exit of major international mining companies from Nigeria to other more investor friendly locations such as South Africa, Canada, Australia and the USA. Since then the mining sector has been largely left abandoned by successive governments. Importantly, there has been little or no foreign investment in the sector but rather a proliferation of small scale activity that hardly reflects in our GDP. In an effort to salvage the mining industry the government in 1995 established the Ministry of Mines and Steel Development. The first Minister Alhaji Kaloma Ali, commissioned the Nigerian Minerals Appraisal and Monetisation Programme to keep, amongst other things, a record of occurrences of minerals in Nigeria; assess the legislative and regulatory framework; support institutions; and design a marketing plan to attract private capital for mining. A mineral policy was introduced in 1997 and the mining decree was promulgated in 1999. The Bureau of Public Enterprise’s intervention in the solid minerals sector reforms was by way of the inauguration of the Solid Minerals Sector Steering Committee in 2000 through the National Council on Privatisation, which led to the privatisation of government owned establishments such as the Nigerian Coal Corporation, Nigerian Mining Corporation and the Aluminum Smelter Company of Nigeria. The steering committee headed by the then Minister of Mines and Steel Development produced a Solid Minerals Sector Policy and a draft of the Mining and Minerals Act for the National Assembly’s consideration and passage into law and eventually, the Nigerian Minerals and Mining Act 2007 was passed into law on March 16, 2007 repealing the Minerals and Mining Act,1999 for the purposes of regulating the exploration and exploitation of solid materials. At the Federal level it is administered by the Ministry of Mines and Steel Development and at the state level by the Mineral Resource and Environmental Management Committee. Additional laws regulating mining in Nigeria include the Nigerian Mineral and Mining Regulation 2011, Mines and Quarries Act 2004, Land Use Act 2004 and the National Minerals and Metals Policy 2008. No doubt each successive government in the last few years has contributed their own quota in trying to reform the mining sector but even at that illegal miners continue to have a field day. That not withstanding it has taken far too long to fully implement the necessary reforms. Reviewing the legal framework as provided by the Mineral and Mining Act 2007 shows that a lot more needs to be considered. Section 1 of the Act on the ownership of mineral resources in Nigeria provides that ‘the entire property in and control of' all mineral resources in, under or upon any land in Nigeria..... is and shall be vested in the Government of the Federation for and on behalf of the people of Nigeria.’ S1. (2) states that ‘All lands in which minerals have been found in commercial quantities shall from the commencement of the Act be acquired by the Federal Government in accordance with the Land Use Act.’ It further provides under S.1 (3) that ‘Property in mineral resources shall pass from the Government to the person by whom the mineral resources are lawfully won, upon their recovery in accordance with provisions of the Act.” This is in tandem with the Section 44 (3) of the 1999 Constitution which vests in the Federal Government the ownership and control of all minerals, mineral oils and natural gas in, under or upon any land in Nigeria, its territorial waters, and exclusive economic zone. The Act further provides that if land is required for mining purposes it will have priority over other uses of land and it will be considered an overriding public interest within the meaning of the Land Use Act. A lot has been provided by the Act specifically to attract investors, such as fiscal and tax incentives and tax relief for 3years or more as well as â€¨exemption from the payment of customs and import duties in respect of plant, machinery, equipment and accessories imported specifically and exclusively for mining operations. The Act further provides for the Central Bank of Nigeria (CBN) to permit a holder of a mineral title who earns foreign exchange from the sale of his minerals to retain in a foreign exchange domiciliary account a portion of his earnings for use in acquiring spare parts and other inputs required for the mining operations and also guarantees free transferability of funds through the CBN. An area of grave concern in the act is the restriction of state governments from developing the mining industry in their respective states due to the limitation of state authority provided by the Exclusive Legislative list in the 1999 Constitution. Item 39 in the Exclusive List includes ‘Mines and minerals, including oil fields, oil mining, geological surveys and natural gas.’ A majority of these states are so poor and can barely survive, existing as they do on allocations from the Federal Government. Developing the mining industry would boost the economy of such states. A constitutional amendment would be required to so permit greater state government involvement but nonetheless it is worth considering. The state of progress in this sector has been poor going by the report by KPMG in 2012 which mentioned that due to the long periods of inactivity and the slow implementation of the Federal Government’s reform agenda in the sector, multinational corporations have been reluctant to fund major mining projects in the country. Infrastructure is also a major problem as oftentimes investors cannot exploit mining resources effectively because of poor infrastructure including incessant power outages and bad roads. Recently the Ebonyi State Governor David Umahi noted that President Buhari’s desire to support the mining sector in Ebony attracted a lot of investors to the state but the federal roads leading to the mining sites are inaccessible which is a major setback. He further noted that obtaining support from the banks and Public Private Partnerships to repair the roads was dependent on the federal government’s assurance of reimbursement and approval of the construction of toll-gates respectively. Security challenges are another major cause for concern, for example the unrest in the Niger Delta and the incessant attacks by insurgents in the North East are also factors that affect the exploitation of minerals around the country. Problems abound but with concerted effort, determination and focus the mining industry can give a major boost to our economy and reduce the unemployment rate bedeviling the country. Our mining laws would need to be reviewed and amended accordingly to provide not just for extraction alone but also processing. With this far greater revenue as well as enhanced employment will be generated in the states. Local content both in goods, services, and knowledge transfer is completely missing from the law as there is only one passing mention of it. It should be spelt out in the law as part of the obligations of mining title holders to do as such. Environmental pollution must also be seriously considered, as its effect on communities can be devastating. International or other best practice standards to which companies will be held accountable must be spelt out. Better integration of international obligations through environmental treaties should be additionally explored and there are already countries in Africa such as Botswana, South Sudan, Ghana and Namibia with well developed mining industries which can serve as good examples to follow. Further efforts should equally be made to engage the global mining industry to provide the attraction the renewed focus in solid minerals requires. The potential of our mining sector is huge and it is time to take this much neglected sector to new, achievable and enviable heights.